Body lotion/moisturizers are the unsung heroes of all beauty products. I'm pretty sure every household has one bottle of body lotion lying somewhere. Traditionally, we use them to keep our skin hydrated. However, body lotions are far more potential than other beauty products. Forget about shaving foam. Your body lotion can perform as shaving agent as good as a RM20 shaving foam and twice more economical. All you need to do is to find a body lotion that has thicker texture or filthy moist. The Nivea In-Shower Body Lotion is the perfect for this job. 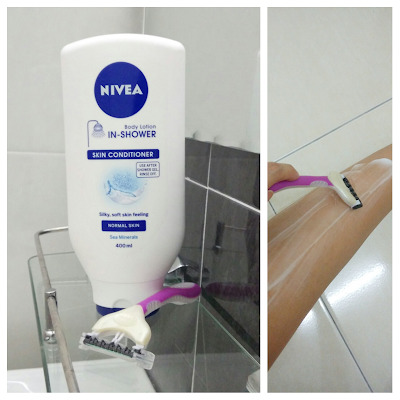 While in shower, just spread it on your leg, grab a shaving razor and start shaving. Wash off with water and voila! 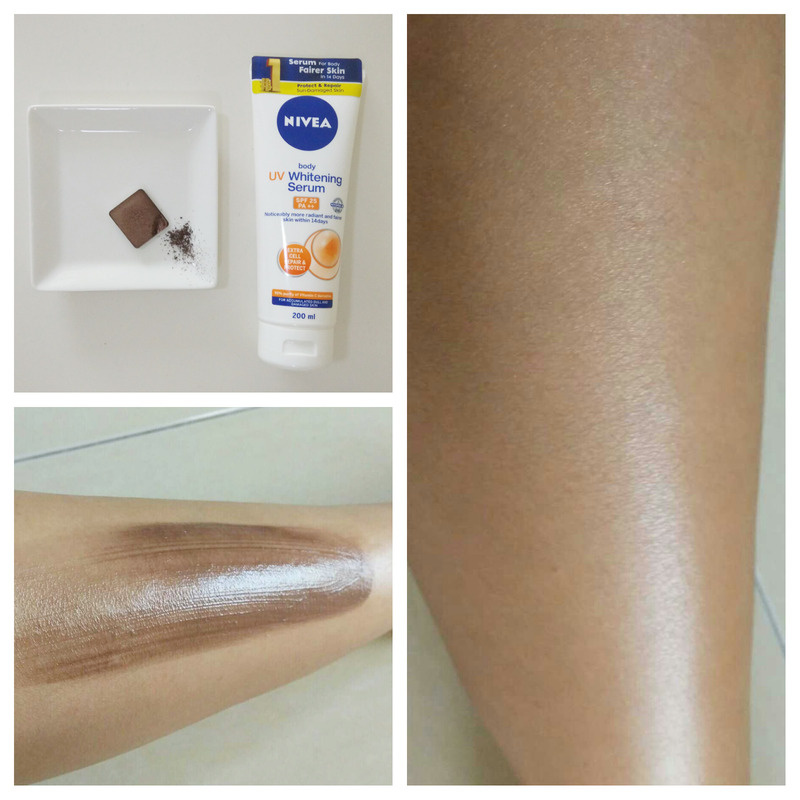 You have a clean and moisturized shaved legs in just 1 minute! This trick kills two birds with one stone - save your money, and save your time. Each time you go on a holiday and purchase a bronzer, it will cost you about RM50. You will use it a couple of times and then it gets tossed into the bin before it's even half empty. If you need to fake a tan, just use your body lotion! But you will need a little bit of brown eyeshadow to get the tanned shade. Cocoa powder works as well, but I don't think it will feel weird on the skin. Choose a shimmery brown eyeshadow for extra glowing effect. A little goes a long way. The ratio for body lotion : eyeshadow is about 10 : 1. I use the Nivea Body UV Whitening Serum because it has a broad spectrum UV protection for day wear. I swear I am one of those mosquitoes magnet. Bugs just love to come near me. Moisquito coil or trap won't work for me. So my only solution is to apply mosquito repellent on myself. All you need is unscented body lotion and essential oils. Choose lemongrass or rosemary essential oil for this purpose as they are natural insect repellent. 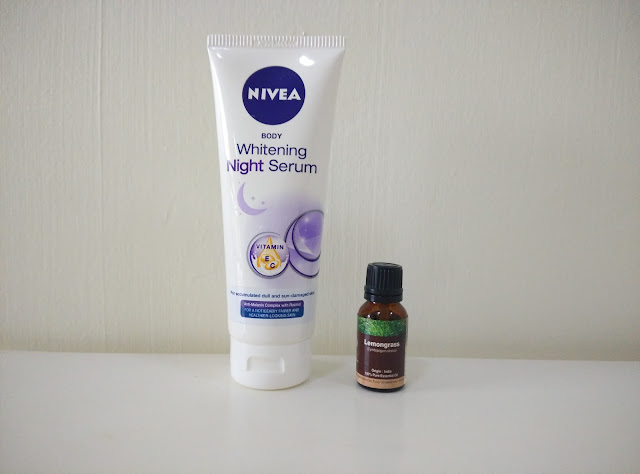 Add 1 drop of essential oil onto your palm, add about 50 cents coin size (the old coin) of the Nivea Whitening Night Serum and apply it on your decolletage, arms and legs. This recipe will treat your skin while you sleep and chase away unwelcome insect bites at night. Forgot your eye makeup remover while traveling? Not a problem. Use the small bottle of body lotion in your hotel bathroom for this trick. Squeeze a little bit of body lotion onto the cotton bud (also available in the hotel bathroom), then slowly remove your eyeliner with it. This trick will not remove your makeup completely. However it helps to prevent your eyes looking like a panda after you wash your face. I'm demonstrating with the Nivea Body Intensive Moisture Serum and it wipes out my eyeliner entirely. Why bother to spend RM30 on a bottle of scrub and rinse it off after one use when you can make this from the stuff you already have at home?! Use a ratio of 1:1 of sugar : body lotion for this hack. Mix well and scrub your skin in a circular motion. When the sugar dissolves completely, wash off the body lotion. This will leave your skin exfoliated, soft and smooth. Thank me later after you try this out. This works better if you have a thicker base for your scrub. 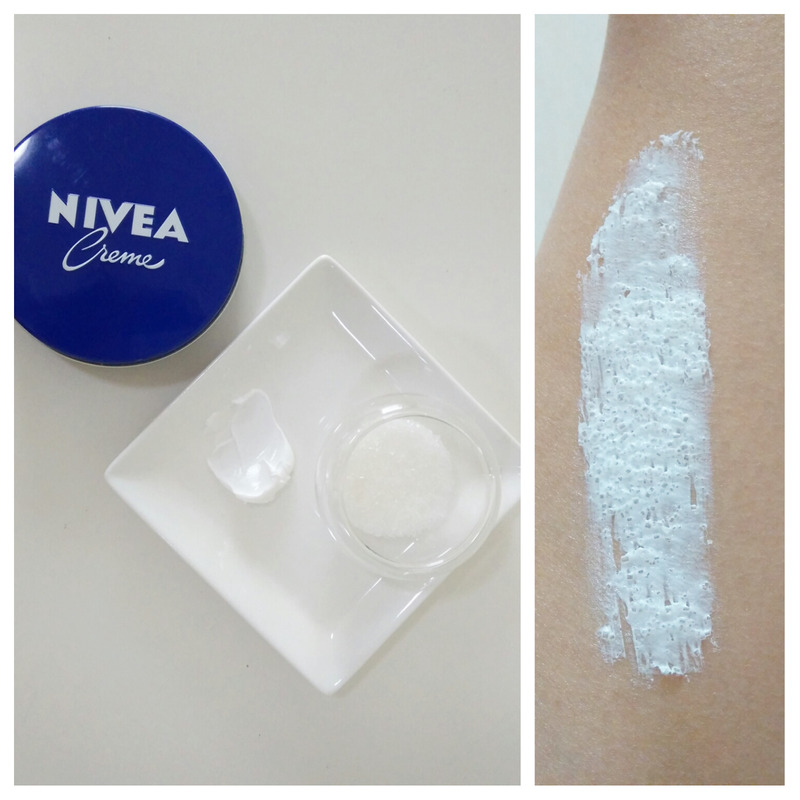 Here I use the Nivea Creme which is one of the oldest beauty product that haven't change its formula since a long time. I'm pretty sure you've seen your mom using this when you're still young. It is one of the most trusted body lotion ever. *Disclaimer: The suggestions above are not for daily solution. 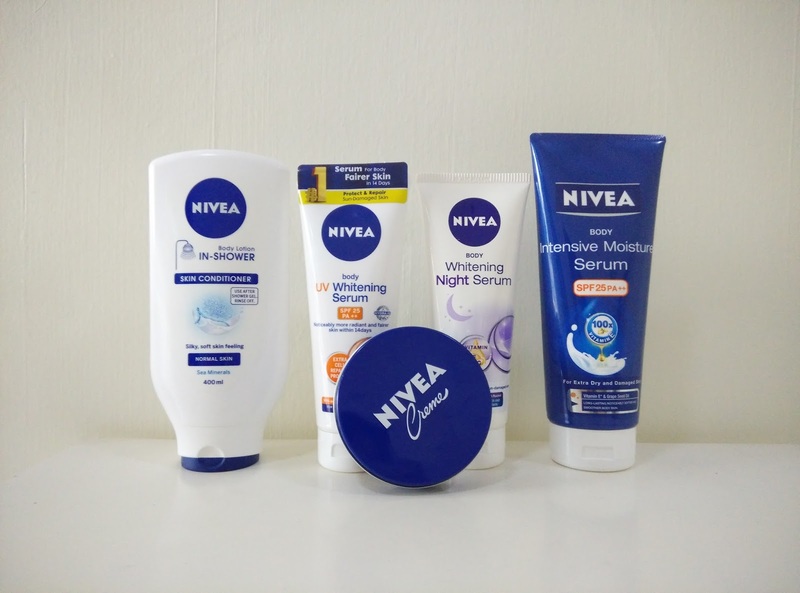 Products are sponsored by Nivea. The concepts are my own. I am very concern about my body skin.Thank you so much for the blog post.You have provide really wonderful information and It is very useful for me.I will definitely follow you blog.